Kobo Rankings for Everlasting on March 13, 2016!!! This should be seen on the Big Screen! ! I dont normally read this type of book, having said that I decided that this book was one I was gonna try as It has had a lot of buzz around it and I must say it did not disappoint, in one of L.K.’s bio’s I read that this story was sort of developed from a dream L.K. had and I cant help but wonder if life after death is a little like this I’m not gonna give any spoilers but there is what I believe to be enough true to life stuff in this book that along with the writing it feels like your reading a real life story! The only problem is that I now want the sequel to be here already! Super fun book! That says a lot about a story and the author’s writing when you become emotionally involved with the characters and especially when it is one you are loving to hate so bad! Not a common I loved it!! That says a lot about a story and the author’s writing when you become emotionally involved with the characters and especially when it is one you are loving to hate so bad! Not a common occurrence for me, but there must have been a growl or 2 involved. It was a really good read and I cannot wait to see the next book come out. I certainly recommend it as I did not put it down until I was done reading in one sitting! YA heading for the big screen . . .
At 17, I was not thinking much of spending a entire summer away from my parents on the beach with my dearest friend. I certainly was not afraid of boys and dying was not even on my radar. L.K. Kuhl has brought me a beautiful, intriguing world of paranormal romance and fantasy wrapped in a subject that is not often approached by the young adults. Most young adults view themselves as invincible. Sweet Sophia is a realist and she knows dying is to be forever. Wow! I can’t believe how great this book was!! Once I started reading Everlasting I could not put it down! I really enjoyed reading it, and I am very excited for the next book. L.K. Kuhl is an extremely talented writer and did a spectacular job writing Everlasting. I highly recommend reading her book!! Ghostly Goodness! What a great read! Everlasting by L.K Kuhl was an exciting story about a girl named Sophia who received a phone call from her best friend Mandy which she hasn’t seen or heard from for a few years. Mandy invites Sophia down to South Carolina for the summer to stay with her. This is Sophia’s last summer before she graduates high school. Sophia meets Mandy’s boyfriend Matt. They have alot of fun together but strange things keep happening. She meets a handsome boy on the beach named Tate. Sophia comes to find out Tate, Mandy and Matt are friends and they have been hiding a big secret from Sophia. It’s an amaing story with a serious situation you won’t want to miss. This story has many interesting parts. You will enjoy reading about all of them as I did. I can’t wait for the next book in The Everlasting Trilogy. 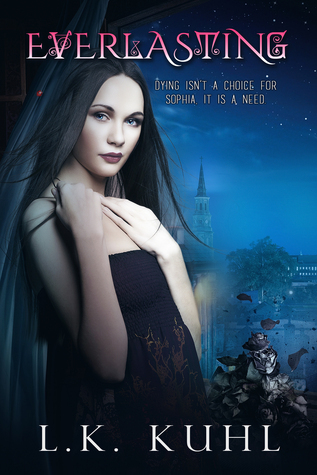 “Dying to know what happens next.”I give Everlasting 4 stars for its creative story. I was first drawn to this book because I know the author. After getting into the story, I was hooked. I had a very hard time getting anything done but read. My dishes and laundry are piled up, but I finished this book in less than 2 days. My heart sank when I read the words The End. I want more! Congratulations Lynette on your first book! Let your pen flow! I’m excited to be apart of this and am looking forward to many more books! There is much here to find fascinating and luring to a world that has not been seen before. This day on the beach turns in to something that Rachel would never had dreamed of. She experiences the world in a way that she never thought possible. In the process she has to confront her fears boys and dying. I am not one to give away the details but this is a read that will and should be enjoyed. There is fascination around each page. Be some of the first to get in on this craze. Everlasting is one to remember for the future. There could be more here than we realize. I see a future movie coming from this one.